February’s Article of the Month (Implementation of mpMRI technology for evaluation of patients with suspicion for PCa in the clinical practice setting) is from work carried out at Northwell Health in New York, and various other institutions in the USA. Northwell Health was founded in 1997 and is a not-for-profit healthcare network that includes around 20 hospitals, Donald and Barbara Zucker School of Medicine at Hofstra/Northwell, The Feinstein Institute for Medical Research, a Center for Emergency Medical Services and a range of outpatient services. 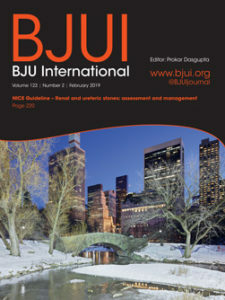 February’s cover shows Gapstow Bridge in Central Park, Manhattan: this stone version was constructed in 1896 replacing the earlier wooden version. It provides a welcome contrast to the modern skyscrapers which form part of the Manhattan skyline beautifully viewed to the South of the bridge. The bridge has been famously used in many films and TV shows, including Home Alone 2 and Dr Who.